At the very end of a meandering dirt road, sits the hilltop town of Monteverde, a cloud forest enclave with an alpine feel. Founded by Quakers in the 1950s, what was once mountaintop pastureland is today a paradise of nature reserves, coffee and cheese production, wildlife (and lots of it! ), and emerald-colored everything. You don’t know green until you’ve seen the many shades and hues of the area’s cloud forests! Our Monteverde travel guide gets the planning started with everything you need to know. Closest Airport: Both the Daniel Oduber International Airport (LIR) and Juan Santamaría International Airport (SJO) are about 4 hours from Monteverde. There is no regional airport. Mother Nature’s playground, that is how some people refer to this place; Monteverde. Translated in English to “Mount Green”, it is a suitable name. This area is lush year-round, thanks to the moisture of the clouds that surround it. This spectacular cloud forest was settled during the 1950’s by a group of Quakers who migrated from the US and who still call this magical place home. When they first arrived, they centered their activities around dairy farming and cheese production. Monteverde is not a national park, it is a private nature preserve established back in the early 70’s by both the Quakers and visiting scientists, George Powell and his wife. When it was first established the preserve consisted of 328 hectares, now it is comprised of 10,500 hectares. Biodiversity is the biggest asset of Monteverde. It is home to at least 400 bird species (including the beautiful yet elusive Quetzal), some 100 species of mammals, and 120 species of amphibians and reptiles. This extensive wildlife lives amid the estimated 2,500 varieties of plants. 420 of these are orchids, that can be seen growing in the wild in almost every tree. This Monteverde travel guide introduces you to the best of this cloud forest town, from private reserves and restaurants, to zip lines and hotels. The cloud forests of Monteverde are one of the most beautiful sights you will ever see. Tours make it easy to access the natural wonders found here. Trained nature guides will take small groups at a time to walk among the beautiful trails, showing you plant varieties, insects, colorful frogs, birds and mammals that inhabit this region. Because the tours are conducted with small groups, you will get a more personalized experience. Feel free to pause to catch in the sights and ask questions as you go along. Nature tours are a fun and educational way to spend your day. The beauty of Monteverde lies in its forest and the biodiversity it houses. What better way to experience this than zipping through its canopy tops. There are several tour operators in the area, all of which are located just outside the town of Santa Elena. It is impossible to say with any certainty which operator is the best, as they each offer different experiences. Here is a brief overview of some of the most popular ones. Sky Trek Park – When you visit Sky Trek you will be lifted via aerial tram to the platform where your zip lining tour beginnings, these are stand-alone sturdy metal platforms that are not attached to the trees. The first zip lines are small to give you a chance to get used to them, and they increase in length and speed as you go. Sky Trek offers some of the biggest and fastest zip lines in the country. They have a total of 10 cables, including Big Daddy which spans over ½ mile through the forest. Monteverde Extremo Park – This tour operator has 14 cables, the longest of which is 3,400 feet long, at an altitude of 600 feet. The park also features bungee jumping, an extreme Tarzan swing and 4×4 buggy tours through the mountain for 1, 2 and up to 4 people. 100% Aventura – Featuring the longest Superman Cable in Central America, this cable spans a mile over the canopy top! They also offer zip lines, ATV tours, horseback riding tours, hanging bridges and rappel. A more relaxed way to experience the forest is a tranquil walk on the hanging bridges. Scientists estimate that close to 90% of the cloud forest organisms can be found in the canopy where sunlight is abundant. 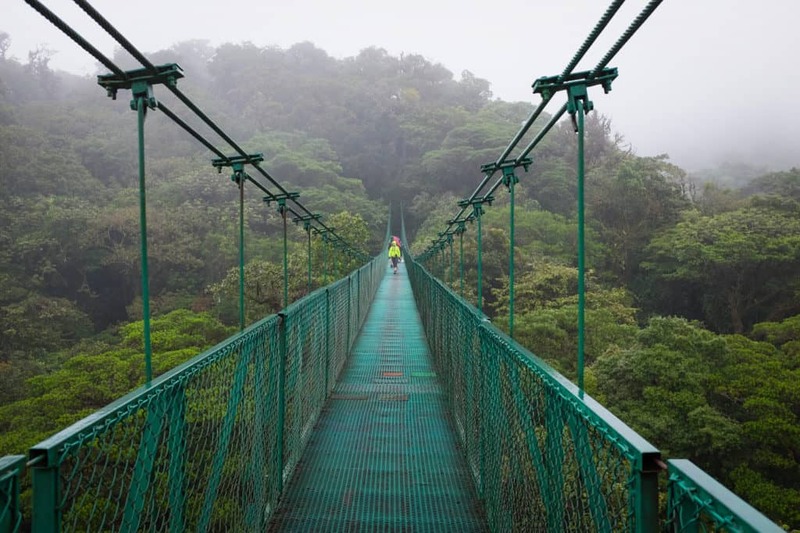 The hanging bridges offer a unique view of the biodiversity that calls Monteverde home, from beautiful birds and playful monkeys to colorful bugs, you can see it all from up here. If you are a thrill seeker, then this will appeal to you. Professional nature guides will take you deep into the forest at nightfall so you can get up close and personal with the night creatures of the cloud forest. The night tours are offered in two different locations; Hidden Valley and Bajo del Tigre. Depending on the time of year and given the migration patterns of the animals, your guides will recommend the best trails for this incredible tour. If you are tired of walking you can always hop on a horse and hit one of the trails. These tours are led by a guide who will take you to some spectacular lookout points and show you all the biodiversity surrounding you. Coffee grows best in high altitudes, and that is why Monteverde is an ideal location for coffee plantations. On this tour, you will see the ins and outs of coffee growing and harvesting and you will also get to sample some of the delicious brew. Meet the original settlers of this magical place, and get a tour of their state of the art cheese factory. As a bonus, you get to eat a lot of complementary cheeses, cured meats, ice cream and caramels… Yum! Monteverde is home to some 400 local varieties of orchids. At The Orchid Garden you will get to see 426 different varieties up close. A trained tour guide will share their knowledge and answer any questions you may have. Cerro Plano’s butterfly garden houses more than 50 species of butterflies, distributed among 4 habitat specific gardens. It also has a medicinal plant garden and a display of arachnids (not recommend if you suffer from arachnophobia); A very educational way to spend a few hours of your day. There are a lot of restaurants and bakeries around Monteverde and the surrounding towns of Santa Elena and Cerro Plano. Some of these not only offer delicious food, but a one of a kind atmosphere. Morphos – Named after a beautiful blue butterfly common in Central America, this is one of the better-known restaurants in Santa Elena. They are open for breakfast, lunch and dinner. Their menu has great variety and the food is very good. Tree House – Also located in Santa Elena, this restaurant features a beautiful fig tree in the center. A bit pricier than some of the other restaurants, but the food is delicious. Their menu has just about everything you can possibly want, from Italian to Mexican dishes and everything in between. They also serve cocktails, wine and beer. If you are staying in Cerro Plano which is located between the town of Santa Elena and the Monteverde Nature Reserve, then you may want to try some of these places. Flor De Vida – A favorite amongst locals and tourists alike, Flor de Vida offers a delicious yet healthy menu with plenty of vegetarian options. Sophia’s – This is a beautiful restaurant that serves outstanding Costa Rican fusion cuisine. One of the more upscale options in the area with a wonderful twist, the prices are very reasonable. The atmosphere is charming and the service is amazing. I recommend the tenderloin in chipotle-butter sauce or the guava glazed chicken. Stella’s Bakery – No trip to Monteverde is complete if you do not stop at Stella’s Bakery for some delicious fresh baked goods. This is one of the oldest establishments in Monteverde. Stella’s is open for breakfast and lunch. Tramonti Restaurant – Delicious Italian restaurant in the heart of the Monteverde reserve. This restaurant has a great variety of dishes and exquisite wines. Rancho Makena – Although the prices place this hotel in the budget hotel category, the amenities available are a pleasant surprise. This quaint family run hotel is set on a dairy farm. Visitors are welcome to explore the property on horseback or foot. The hotel offers standard rooms with complimentary breakfast or chalet style cabins which come equipped with a kitchen. They also offer a shuttle service to Santa Elena in the morning and afternoon. Hotel Heliconia – This beautiful hotel looks like it belongs in the Swiss Alps. Constructed from gorgeous local woods and surrounded by manicured tropical gardens, the hotel offers 50 comfortable rooms, two restaurants, a bar and a luxurious spa. This is a great mid-range hotel. Monteverde Lodge – This is one of the top hotels in the Monteverde area. This lodge offers large comfortable rooms with spectacular views to the gardens. In tune with the conservation efforts for which Monteverde is known, the hotel utilizes solar panels to heat the water. They also recycle and have added high efficiency lighting and water-saving fixtures to minimize their environmental impact. The Monteverde cloud forest straddles the continental divide of Costa Rica, in the northern region of the Tilarán mountain range. It is located in the borders of two provinces, Alajuela and Puntarenas, and is about 100 miles from San José. Because of its location high above the mountain range, with an altitude of 5,900 feet (1,800 meters) at its highest point, the area is always surrounded by misty clouds that give the impression of being in a fairy-tale land. Note that the highest hiking trail is located at 4,100 feet (1,250 meters). Rains are plentifully in the area with an average of 118 inches per year. The month of October has the heaviest rain falls. Although 100 miles does not sound like much, getting to Monteverde is an adventure. Parts of the road are not in optimal conditions and the mountainous terrain makes for a slow drive. Be prepared to spend anywhere from 4 to 5 hours to get to your destination if traveling from San José. Direct buses leave from San José twice a day, at 6:30 am and 2:30 pm. The bus stop is located at Calle 14 and Avenidas 9 & 11. This is where the old bus station to Puntarenas used to be. Even though this is a direct bus, it does stop in the town of Sardinal to allow people to use the restroom and buy food. The bus ride takes 5 hours. If you are renting a vehicle during your trip to Costa Rica, and you plan to visit Monteverde, know that you will need a 4×4 vehicle to get there. The best time to start your journey to Monteverde is early in the morning. The possibility of rain in the afternoons is high and driving conditions deteriorate which could delay your arrival. A word of caution – driving in Costa Rica can be an adventure. Directions are mostly given based on landmarks and not street names. Not to worry though, locals are friendly and they will be happy to help. We recommend using the app Waze or something similar to assist you. Drive time is between 4.5 and 5 hours, as is the case in most countries be careful about picking up hitchhikers and never leave your luggage in the car unattended. This unique travel modality is available if you are traveling from La Fortuna to Monteverde. You will be picked up by car usually a minivan or small bus and taken to the Arenal Lake where you will board a boat to get across the lake, at the other side another car will be waiting for you to take you to Monteverde. A trip to Costa Rica is not complete unless you take a walk in the clouds! Monteverde is a unique destination; it allows you to not only experience the beauty of the rare and fragile ecosystem of the cloud forest, but it immerses you in a different mindset. Walking through the Nature Preserve you will feel an intense appreciation of Mother Earth.